The ox is the second symbol in the Japanese zodiac. Legend has it that although the scheming rat snatched the first place in the race to God, God appreciated the patience and determination of the ox, who arrived in the second with a slow but steady pace. This symbol represents “loyalty” and “patience”. 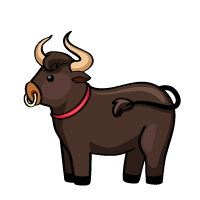 Oxen are calm, good-tempered, and trustworthy. They do things steadily, and do not spare any effort in achieving their goals. On the negative side, they can be quite stubborn and lack the flexibility to adapt to drastic changes. Like to wear plain clothes. Think too much before taking action. Do not listen to others once they set their mind. Oxen are most compatible with snakes and roosters. If these three come together, it generates a great positive power. Oxen also have a mutually beneficial relationship with rats. Sheep are the least compatible with oxen. In Japanese, an ox is “ushi” in romaji and is written as “牛” in kanji. In the Japanese Zodiac, however, an ox is written as “丑”.